Stainless steel precision cutting blade. Ergonomic body design for comfortable use. 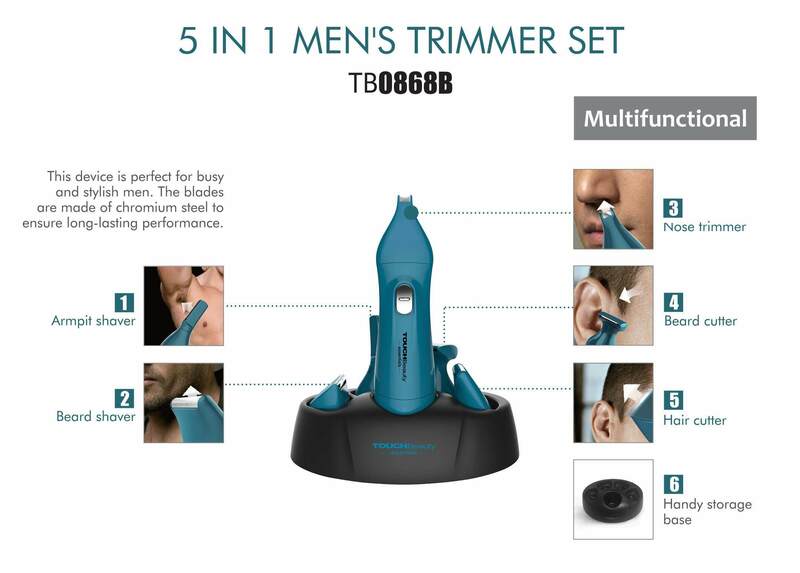 Five interchangeable trimmer heads: beard cutter; beard shaver; nose trimmer; armpit hair shaver; hair cutter. The Foil Shaver will give you a perfect finish around the edges and rounded tips while protecting your skin. The detail shaver is perfect for fine lines, small areas, and details. The ear and eyebrow trimmer helps trimming unwanted hair. The nose hair trimmer features a rotary blade system that uses a circular blade action for efficient hair trimming. Battery operated 2 AAA battery ( not included ).